Ben Robinson is announced as Panoramic34 ‘Employee of the Year’. Congratulations on winning “Employee Of The Year” – Why do you think you were chosen for this award? Thank you very much, I am very proud to have been awarded Employee of the Year! I believe I was chosen for this award because I am always willing to help others in different roles, as well as assisting my team when required. I like to think I go above and beyond for not just our guests but for my colleagues as well. How long have you worked at Panoramic 34? 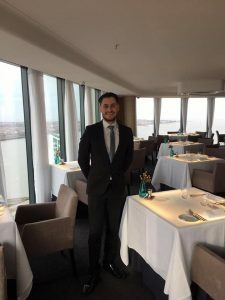 I have been working at Panoramic 34 for almost 3 years now (March 31st 2014) it is a great company to work for from our Owner, to our management and staff, everyone works extremely hard to ensure our guests receive a great experience every time they visit us. I am a very sociable and chatty person so the most enjoyable aspect of my job is definitely meeting new people on a daily basis. I also enjoy the fact that every day at Panoramic 34 is different, from the views to the guests, it’s nice coming to work not knowing what to expect. Is there anything you find challenging about your role? 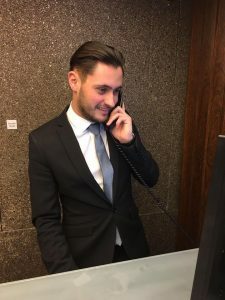 The most challenging aspect about my role is training new members of staff because everyone learns at different speeds and there is a lot to take on board in such a short space of time, however it is extremely rewarding watching them progress into fantastic members of the team. What is your favourite dish on the current menu? I’m a massive lover of beef so it has to be the Beef Fillet – cooked rare which is accompanied with ox cheek, crispy potato, gnocchi, artichokes and parsley puree, It really is incredible. When you are not at Panoramic 34, where would we find you? I’m a huge Liverpool fan so I will most likely be at the game or socialising with friends and family. You have recently completely your Level 2 NVQ in Customer Service – How did you find this? What have you gained from completing this? I thoroughly enjoyed my NVQ, I have learnt so much from the health and safety aspect to ensuring customers receive a first class service. Completing this NVQ I feel as if my customer service, communication skills and confidence has improved greatly. What’s next for you? Another NVQ? Next for me is my Level 3 NVQ which covers more complex work and will help me develop my supervisory skills, I am really looking forward to this as I feel there is so much more for me to learn in hospitality.